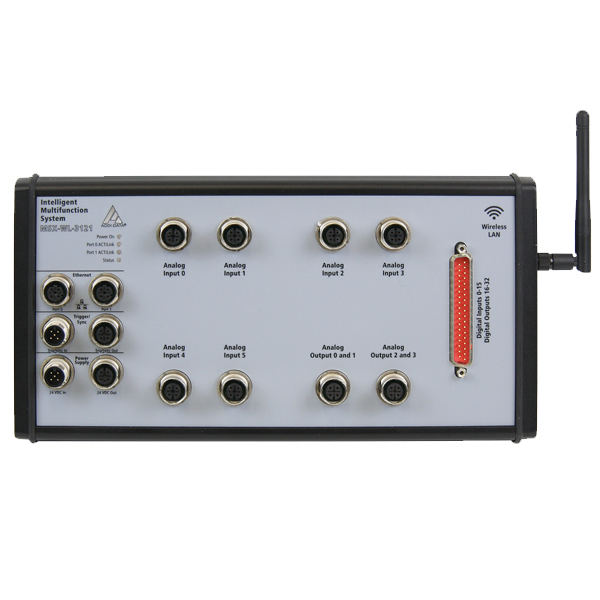 The WI-FI Ethernet multifunction system MSX-WL-3121-6-4 has 6 analog diff./SE inputs (voltage or current inputs), 24-bit, 4 analog outputs (voltage or current outputs), 16-bit, and 32 digital I/O, 24 V. For use directly in the field, the system is equipped with a robust metal housing and numerous protective circuits. The intelligent WI-FI Ethernet systems of the MSX-WL series allow precise data acquisition and reliable signal output directly in the field. The systems can be easily configured from a workplace in the company network. The user can adapt the configuration and read the acquired data using mobile devices (such as tablet, smart phone, etc.) through the MSX-APP Manager for Android. The ARM®9 32-bit processor allows to calculate the acquired values onboard, for data storage, 64 MB onboard SDRAM is included. For fast error diagnostics, the system comes with a status LED. The WI-FI Ethernet systems of the MSX-WL series can be combined with the intelligent Ethernet systems of the MSX-E series.